Graphic -- Ghana's debt stock reduced from $7.1 billion in 2003 to $6.1 billion as of Wednesday, December 15,2004. 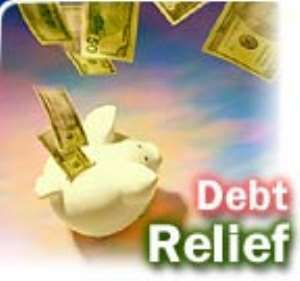 Currently,debt relief enjoyed by the country from her donor partners stands at $1.355 billion. A Minister of State at the Ministry of Finance and Economic Planning, Dr Samuel Nii Noi Ashong, made this known in Accra yesterday after the signing of a $2.4 million grant agreement between Ghana and China. Dr Ashong signed the agreement on behalf of the government,while the Chinese Ambassador to Ghana, Mr Zhang Keyuan, signed for his government. Dr Ashong said the two countries would continue to hold discussions on how to utilise the facility on priority projects they would agree upon later.He gave the assurance that the government would put the facility to good use to achieve the aim for which it was given.China has been one of Ghana's major development partners since the inception of bilateral relations between the two countries in 1961. China has, up to date, given Ghana assistance to the tune of about $135.6 million, made up of grants and loans. Dr Ashong said China was among the first of Ghana's development partners to cancel part of the country's debt to the tune of about $53.1 million and expressed the government's appreciation to the Chinese government for the gesture. The minister recounted some projects which were financed from the assistance of the Chinese government. These include the National Theatre, the construction and rehabilitation of police and military barracks, the construction of the Dangme East District Hospital at Ada and the provision of about 350 hand-pump boreholes in six districts of the Greater Accra Region. Among ongoing projects that the Chinese government is currently sponsoring are the reconstruction of the Ofankor-Nsawam dual carriage-way, the construction of the Kumasi Youth Centre, the construction of an office complex for the Ministry of Defence and the supply of equipment to the Ministry of Finance and Economic Planning. Dr Ashong said all those forms of assistance “clearly demonstrate the Chinese government's commitment to the development efforts of Ghana, especially in improving the vital sectors of the economy”.He expressed the government's gratitude for the assistance and appealed to the Chinese government to consider Ghana's request to it for additional HIPC relief by way of debt stock cancellation of some of the country's outstanding debt. That, the minister said, was to accelerate the country's development agenda by implementing the Ghana Poverty Reduction Strategy (GPRS).Dr Ashong noted that under Positive Change Chapter Two, more resources would be channelled into the social sector to achieve the goals of the GPRS.He said the focus of the GPRS would be on deprived regions such as the Northern, Upper West, Upper East and Central Regions. For his part, the Chinese Ambassador, Mr Zhang, lauded the bilateral co-operation between Ghana and China and expressed the hope that it would be expanded to cover more sectors of the two countries, particularly the area of good governance.He congratulated the government and people of Ghana on the conduct of a peaceful election.